Home  Candle Making Supplies  Candle Wax  Gel Wax - Thirty Lbs. original form, and that is where the polymer resin comes into play. This resin is used to thicken the mineral oil to give it the clear, slow burning wax that we know it as. The patent on gel wax and the gel wax process is actually owned by Penreco. They refer to this wax as VersaGel. Melting Gel Wax is slightly different than any of the other paraffin or soy waxes on the market. Unlike the afore mentioned waxes, there is not a simple temperature that you are looking for that will liquefy the wax, rather it slowly thins. You must be very careful in watching the wax while it is on the heat source and stir frequently. This will be the key to ensuring the proper melting process. As well, do not be tempted to turn your heat source on a higher setting. Gel wax will not melt quicker, it will just smoke more. Gel wax is only to be used as a container wax. The gel itself is not sturdy enough to stand alone like pillar wax is. 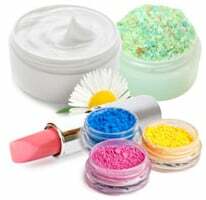 If you are planning to embed your Gel Wax candles, choose non-flammable items such as sea glass, sand, glitter, sea shells, marbles, glass figurines, wax embeds. Never use plastic embeds in your gel wax candles. Decorating your gel wax candles with these embeds can produce beautiful artwork, but remember to leave enough room for the gel wax! Don't go too crazy adding embeds or your candle will not burn. 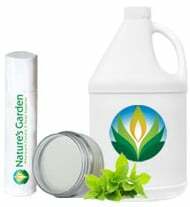 Because Gel Wax is mainly composed of oil, you have to make sure that the fragrance oils that you are using are soluble in it. 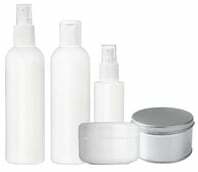 Many companies say that non-polar fragrances need to be used in gel wax. 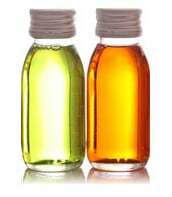 However, it is chemically impossible to make fragrance oils non-polar. 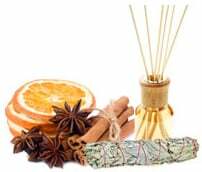 All fragrance oils contain a mixture of ketones, aldehydes, esters, resins, and essential oils. These fragrance oil components all have some level of polarity; meaning that they are capable of oxidation. Fragrance oils can be made gel wax compatible by adding isoparsolvents to lower the polarity; but they will still have some level of polarity. Lowering the polarity will help make the fragrances miscible in mineral oil. A mineral oil miscibility test is still required for each fragrance you use in gel wax. To test for solubility: mix 1 part fragrance to 3 parts food grade mineral oil. Shake and allow to set a couple of minutes. Check to see if the fragrance thoroughly mixes with the mineral oil. Now take 3 parts fragrance to 1 part mineral oil. Shake and allow the mixture to set a couple of minutes. Check to see ifthe fragrance thoroughly mixes with the mineral oil. If you see any type of insolubility or cloudiness, the fragrance is not good to use in gel wax candles. In addition, the flashpoint of the fragrance oil must be at least 170 degrees Fahrenheit. This is due to the gel wax candle burning at a much higher temperature than traditional waxes. If there is a big enough difference in the flashpoint of Gel Wax, and that of your fragrance oil, you will have an unstable overall flashpoint of the blended product, which is unsafe. If you are choosing to add depth or color to your Gel Wax candles, liquid candle dyes are the best and only route to take. 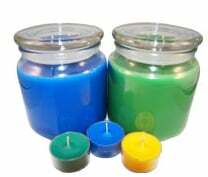 Although powder dyes or color blocks can be used, they often clump, therefore making it very difficult in attaining a uniform color throughout the whole candle. Never use food coloring or water soluble soap dyes. Selecting the right container for you Gel Wax candles is just like selecting the container for traditional waxes. There are three main laws to remember when doing this. First, the container must be resistant to cracking. Obviously, you do not want to have a container that cracks and makes for an unstable candle. The second is the container must be able to take the heat from the flame and melted wax. Lastly, the container cannot leak. As with any candle, there will be a wet pool of wax, you do not want this hot liquid spilling out. When it comes to selecting the appropriate wick for Gel Wax candles, the rule of thumb is to wick one size up. In order to find the wick you are looking for, you must measure the diameter of the opening on your candle container. Once you have this information, you need to select the appropriate Zinc Wick. Do not be tempted to purchase a cotton wick. These wicks have a tendency to absorb too much gel and this will extinguish them. From this point, it is just finding the right wick according to your diameter and then selecting the next bigger sized wick. With all of the possibilities available for Gel Wax, many candle crafters enjoy using this product. As long as you follow the safety guidelines, imagination is the key to having brilliant Gel Wax creations. Another amazing factor that Gel Wax has is it is very forgiving. Any of the physical attributes or scent problems that you are not happy with are very easy to fix. It is literally as simple as remelting, repouring, rescenting, or recoloring. Always, always, always, make sure that the first burn of your new candle is a memory burn. This is also something that you should share with your customers. A memory burn is vital to establish a clean wax free candle container when you are done. In order to figure out the correct memory burn time for your candle, you must know the diameter of the container. This is the same information that you need to know for the wick size. Once you have this data, for every inch that your diameter is wide you need to calculate one hour. In essence, if your diameter is 2 and 1/2 inches, your memory burn time is 2 and 1/2 hours. During this time your candle will reach a full wet pool. The full wet pool is exactly what you need to have the best quality burn and scent throw possible. If you do not burn your candle using the memory burn method, then every time you relight your candle you will get what you call a core burn. A core burn is a wet pool that essentially only burns around the wick. This burn will never give your candle the full scenting ability that gel wax has to offer. Plus, when the wick is completely gone, you will still have wax around the container edges, and on the bottom. There is also another consideration for Gel Wax candles that needs to be noted. If a Gel Wax candle is set on its side, or placed upside down, it will eventually start to pour out. It is very important to consider this for two reasons, storage and shipping. Another key factor to consider when burning a Gel Wax candle is not move it while it is lit or cooling after being lit. The liquid gel is very hot and will cause severe burns. When you are in between burns of your Gel Wax candle, it is advisable that you lid your container. Due to the nature of the Gel Wax, the top layer will be sticky. By covering the candle, you will prevent any dust, bugs, or debris that will stick to the top of your candle. Before reigniting your candle always trim your wick. Keep the wick short, around 1/4", and keep yourself safe. Never leave a burning Gel Wax candle unattended. Keep all candles away from children and pets. Purchasing this can earn you 99.99 ($1.00) rewards points! 5.0 1 Gel Wax - Thirty Lbs. 5 Gel Wax - Thirty Lbs.